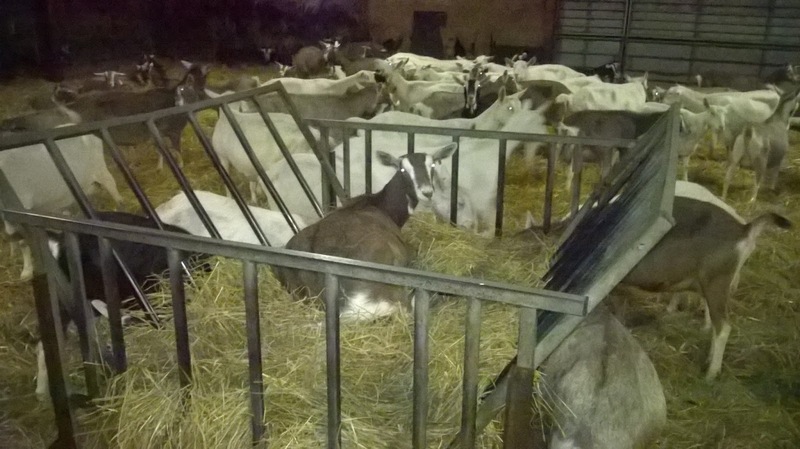 Ellie's Dairy - The Finest Goat Milk, from Kent: Never a dull moment ..
Never a dull moment ..
As the days get shorter and the mornings get darker, it becomes increasingly difficult to get those goatie girls out of their comfy beds for milking. 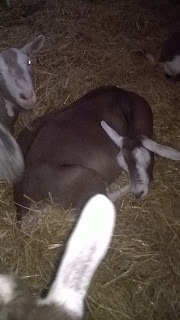 Some of them take advantage of an empty hayrack to bag the best spot in the barn ..
Others just stay curled up fast asleep and hope that you won't notice them .. Not sure who that ear belongs to! And in the evening, they are all very keen to get back indoors - they don't like standing outside in the dark. 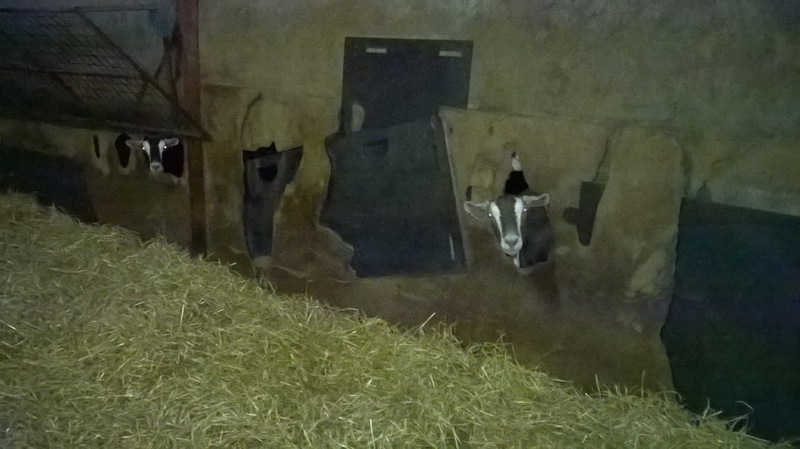 One side of the barn is just made of thick wooden boarding at the bottom which goaties like to gnaw .. Over the years they have gradually worn it away in places and there are odd holes which they can stick their heads through. 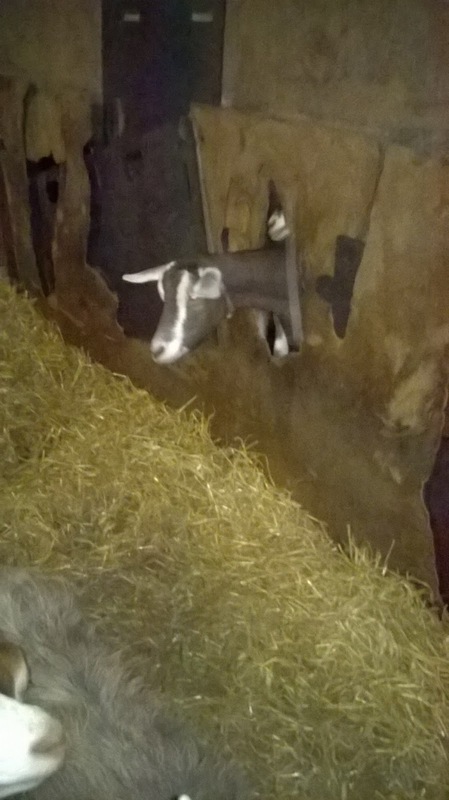 It all needs to be properly replaced before bad weather sets in, but at the moment they can still use the holes as windows ..
And from the outside, the view is something like this ..
Never a dull moment with goats! Our dear Husky goat is gradually drying off that one-sided udder which she is extremely pleased about as it means that she does not have to come in for milking twice a day. So, back to her old tricks, she takes full advantage of her new status as one of the 'useless goats' and helps herself to food out of the wheelbarrow and anywhere else that takes her fancy. 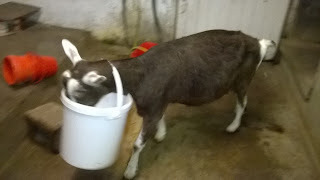 And should her chosen bucket be tightly closed, it would appear that this is no obstacle to a determined Husky goat ..
Young Hilton is still a very busy boy with lots of girls queuing up for his attention. 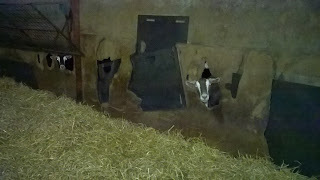 This morning I could hardly see his pen through the crowd of wagging tails. 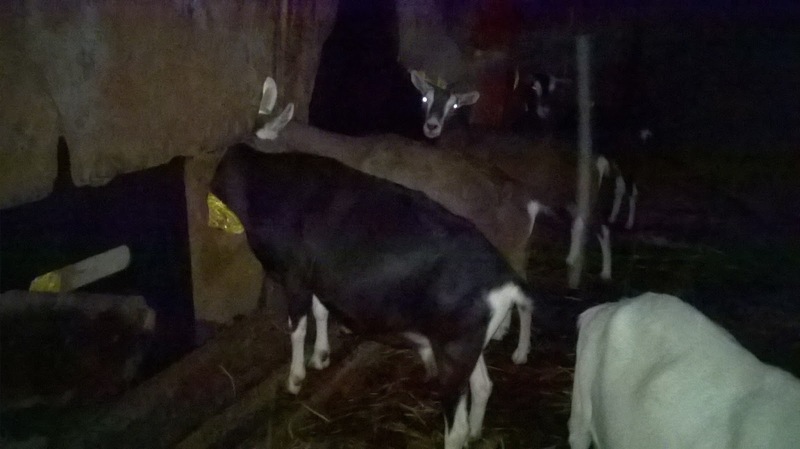 The girls outside his house are noisy and fight to be next to the gate so that they can talk to him .. the girls inside just won't leave him alone! And amongst all this noise and chaos, old Betty goat just soldiers on in her own little world .. But even she can still raise a smile with her antics. 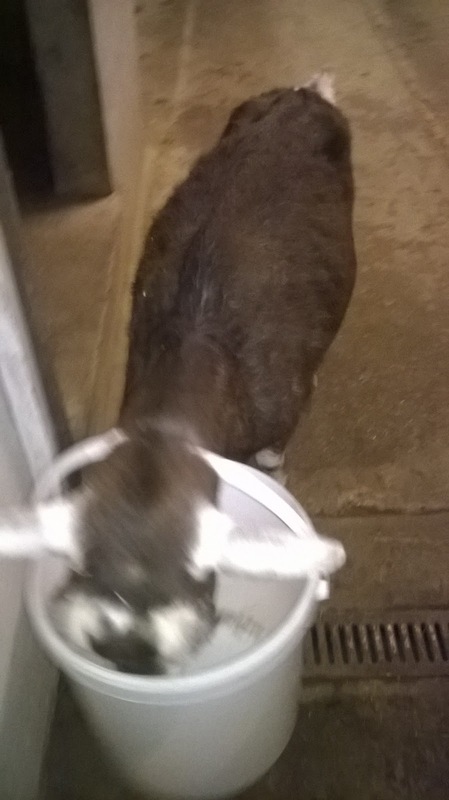 One day last week there was just something too tempting at the very bottom of a bucket ... And this is what happens to naughty greedy goats ..